The auto brand saw dramatic increases in engagement by using Deal Maker Pro to create a fan-exclusive sweepstakes campaign on Facebook. Create a customized sweepstakes campaign on Facebook as a fun Easter challenge. Not only is Vionic super easy to use on the client end it is amazingly viral on MY customer’s end which is EXACTLY what I want and recommend to anyone looking to BOOST their campaign. How Did Whitby Toyota-Scion Do It? Serving the Durham Region and Greater Toronto area, Whitby Toyota-Scion is the premier retailer for new and pre-owned Toyota vehicles. Their sales team and factory-trained technicians aim to ensure a pleasant, easy and financially beneficial shopping experience. 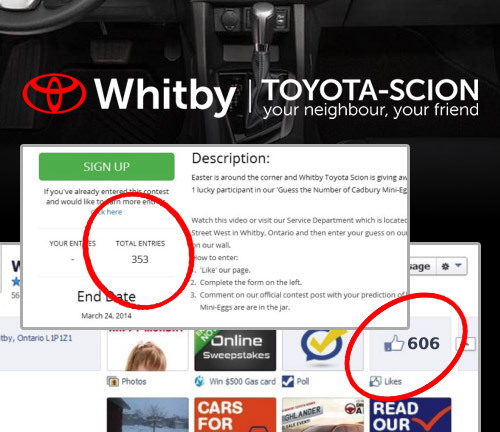 Whitby Toyota-Scion wanted to reach consumers on Facebook by engaging with their online audience and offering relevant prizes to help generate customer leads. Whitby Toyota-Scion used Vionic Deal Maker Pro to create a customized sweepstakes campaign on Facebook. As a fun Easter challenge, participants were required to guess the total number of Cadbury mini eggs on display for a chance to win a $500 gas card. The automotive company made sure to engage with their audience by posting daily clues on YouTube and Twitter. Email marketing and Facebook posts were also utilized, along with a $250 budget for self-managed Facebook advertising. Targeting potential customers on Facebook using Vionic Deal Maker Pro proved to be an effective strategy to generate new leads and promote brand awareness, resulting in increased engagement on their Facebook page.